Sermon Summary. In this text, the Jordan River is an obstacle that stands between the community of faith and the promise that God has made to them. They must cross the Jordan to get to the new territory. Similarly, in our own lives, we anticipate or are confronted with our own Jordan Rivers. We are aware of the promises of God. But, at the same time, we know or envision the hurdles that stand between us and those promises. 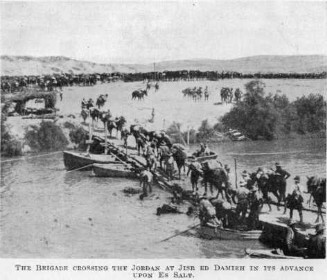 In this narrative, God had Israel approach the Jordan in a unique way and at unique times. It is the same way with us in our Jordan experiences. Sometimes, God has us approach in a unique way and a unique time. How will we respond? God sent the priests and the Ark of the Covenant into the water. It was in God’s way and God’s time. He then commanded the people to come up out of the Jordan experience. He commands us to come through and come up out of our own Jordan experiences. It is the path through which we enter into the new territory that God has for our lives. It also establishes a new testimony for us and future generations. It was that way for the community of faith then. It’s that way for the community of faith now. Come up out of the Jordan! New territory, New testimony. New Territory. We continue to look at this concept of new territory. Israel is going to have to go through the Jordan and bring the walls of Jericho down. Let us never get confused and assume that the path that God promises and new territory is going to be easy. I ask you to continue to reflect on the new territory God has for you in your life. What are some of the challenges that we or others experience before get into new territory? Crossing the Jordan/God’s Time and God’s Way. The Jordan was always going to be before Israel on its way to the Promised Land. But, they had to trust God’s way and God’s timing to determine how they would cross it. Nobody would’ve planned ahead for the way God did it … sending the priest and the Ark of the Covenant beforehand into the river and the water separated. This was clearly not man’s plan. This was God’s time and God’s way. It is the same way in our lives with our Jordan experiences. We have to be prepared to approach them in God’s time and in God’s way. What are some challenges that we have doing things in God’s time? Do we ever want to move too fast (Golden calf experience)? Do we ever end up moving too slow (ten spies experience)? Why? What are the challenges in doing it God’s way? Do we ever find we want to do it our own way? Do we ever doubt or have an uncertainty about the way God has laid out before us? New Testimony. Finally, we see in this text the power of remembering and testimony. Joshua calls on the people to collect 12 stones as a point of memory and as a point of worship about what God did. That is a portion of what we do when we worship together in as a church body – remembering what God did. But he also directs that there is a new testimony. One generation has a testimony of the Exodus and the parting of the Red Sea. This generation will have a new testimony-crossing the Jordan on the dry land. What are some of the testimonies of the past that we find ourselves standing on today? What are some testimonies of the present that we can stand on or others can stand on? As we reflect on the future, what testimonies have we laid foundation for present and future generations?